Fiction. The ten stories in this haunting and hilarious collection offer a how-to manual for dealing with love, lies, and loneliness. Sam Wesson, an up-and- coming country-western singer, plots to get pregnant without her boyfriend's consent, while Dacey, already pregnant, confronts her cheating husband over her secret checking account. Andrea rescues a stray dog to avoid facing her complicated human relationships. Sarah, an exotic dancer, longs for employment at a religious theme park, and Amelia dreams of creating impossible bonsai. Whether facing life-threatening illness or overwhelming loss, these characters scheme in humble, funny, sympathetic, and outrageous ways to find an etiquette that will deliver them from disappointment and shield them from crushing grief. 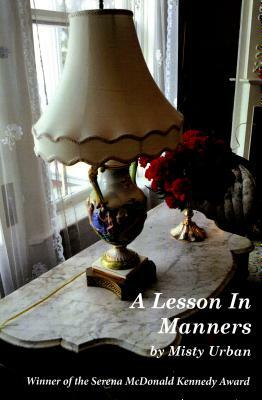 Filled with vivid characterization, dry humor, and luminous, searing prose, A LESSON IN MANNERS tenderly embraces deeply flawed characters who learn that, in the face of frightening bewilderment or deep pain, a precise, brilliant attention to every moment is the only way we survive.